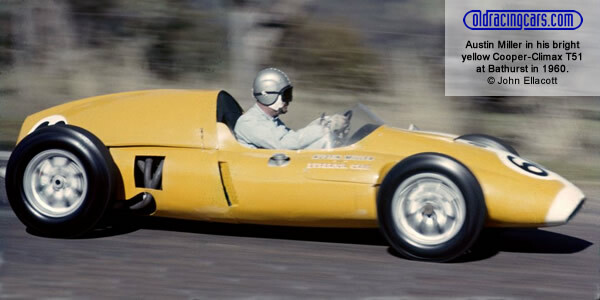 Alec Mildren acquired one of the latest Mk IV 'T51' Coopers, fitted a 2.5–litre Maserati 250S engine and ran away with the 1960 Gold Star. After finishing second to Jack Brabham's T51 at Longford in March, he won the next three races plus the final round at Caversham in December. Also in a late-1959 Mk IV was Bib Stillwell who won at Port Wakefield in October, the only Gold Star race Mildren didn't finish, and also won races at Fishermen's Bend and Warwick Farm at either end of the year. A string of seconds and thirds in the Gold Star races gave him second place in the table ahead of Bill Patterson who retained his 1959-model T51 but only won one race, the Phillip Island Gold Star in December which Mildren didn't attend. Every race of the season was won by the 1959/60 Mk IV Cooper, known retrospectively as the 'T51'. The other three non-Gold Star races in 1960 were all won by Jack Brabham. Additional information is still required. Programs are needed for most races - the only exceptions being the Bathurst 100 and the Australian Grand Prix. Full results are also needed for the Celebrities Scratch Race, the Queensland Road Race Championship, the Victorian Road Race Championship and the Hordern Trophy. Qualifying times are not known for some races, notably the Victorian Trophy and the Victorian Road Race Championship.